My friend Veronica Roman recently invited me to join her new linkup group, Monthly Moment. This invitation provided the perfect excuse to get back into a blogging routine. My posts have been scattered since starting my full-time job at Elon and I still find myself searching for my blog identity. Veronica says share a single photo to capture a moment for the month that you want to pause and savor. My one word for 2015 is mindfulness, and this monthly linkup will provide another avenue for me to reflect on positive experiences in my life and be more mindful. When I look back, I remember that April has been a challenging month and an amazing month at the same time. There are a few things not represented in the photo I chose but worth mentioning. My family celebrated the life of my one of my biggest heroes, Mama, and I also made forever memories with friends from all areas of my life, including seeing Kenny Chesney on the front row in Greensboro and road-tripping to Athens, GA to be with CSAA cohortmates again. 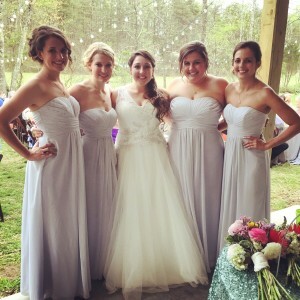 But for my monthly moment I chose an image from my best friend Taylor’s beautiful wedding. The wedding reunited my close group of college girlfriends (we currently live in 4 different cities) for a long weekend. This time together reminded me that no matter what happens or where we are we will always be the best of friends. And that I always have something to learn from these amazing women.